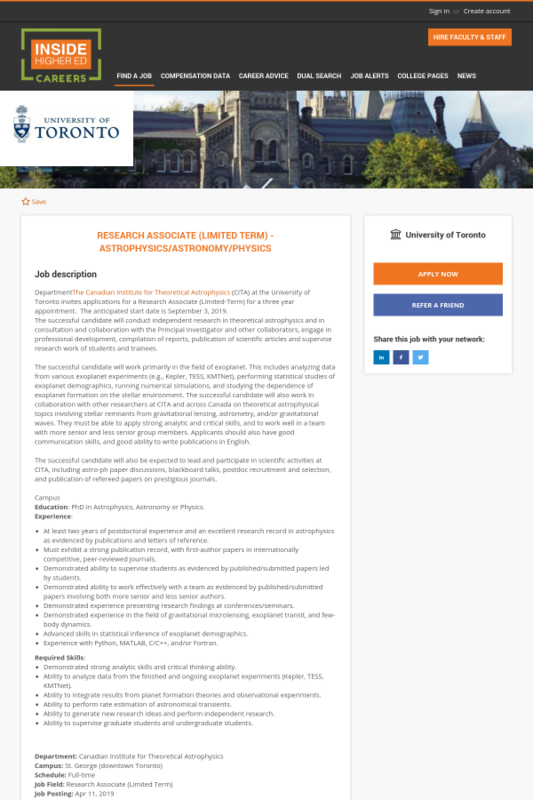 DepartmentThe Canadian Institute for Theoretical Astrophysics (CITA) at the University of Toronto invites applications for a Research Associate (Limited-Term) for a three year appointment. The anticipated start date is September 3, 2019. The successful candidate will conduct independent research in theoretical astrophysics and in consultation and collaboration with the Principal Investigator and other collaborators, engage in professional development, compilation of reports, publication of scientific articles and supervise research work of students and trainees. The successful candidate will work primarily in the field of exoplanet. This includes analyzing data from various exoplanet experiments (e.g., Kepler, TESS, KMTNet), performing statistical studies of exoplanet demographics, running numerical simulations, and studying the dependence of exoplanet formation on the stellar environment. The successful candidate will also work in collaboration with other researchers at CITA and across Canada on theoretical astrophysical topics involving stellar remnants from gravitational lensing, astrometry, and/or gravitational waves. They must be able to apply strong analytic and critical skills, and to work well in a team with more senior and less senior group members. Applicants should also have good communication skills, and good ability to write publications in English. The successful candidate will also be expected to lead and participate in scientific activities at CITA, including astro-ph paper discussions, blackboard talks, postdoc recruitment and selection, and publication of refereed papers on prestigious journals. Education: PhD in Astrophysics, Astronomy or Physics. At least two years of postdoctoral experience and an excellent research record in astrophysics as evidenced by publications and letters of reference. Must exhibit a strong publication record, with first-author papers in internationally competitive, peer-reviewed journals. Demonstrated ability to supervise students as evidenced by published/submitted papers led by students. Demonstrated ability to work effectively with a team as evidenced by published/submitted papers involving both more senior and less senior authors. Demonstrated experience presenting research findings at conferences/seminars. Demonstrated experience in the field of gravitational microlensing, exoplanet transit, and few-body dynamics. Advanced skills in statistical inference of exoplanet demographics. Experience with Python, MATLAB, C/C++, and/or Fortran. Demonstrated strong analytic skills and critical thinking ability. Ability to analyze data from the finished and ongoing exoplanet experiments (Kepler, TESS, KMTNet). Ability to integrate results from planet formation theories and observational experiments. Ability to perform rate estimation of astronomical transients. Ability to generate new research ideas and perform independent research. Ability to supervise graduate students and undergraduate students.